These are the remains of a pet dog buried in the vicinity of the Danish Fellowship Hall in Davenport in the mid-19th century. 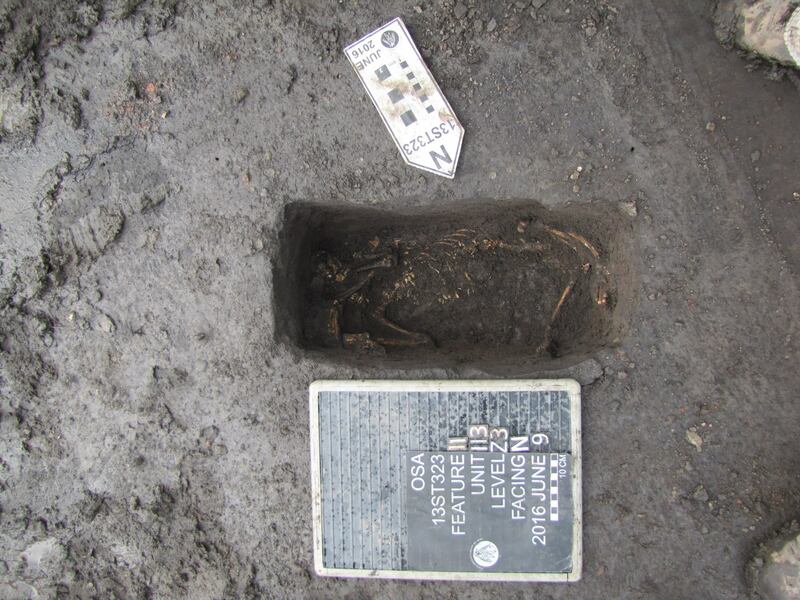 This medium sized dog was interred lying on its back in a rectangular grave that was excavated as part of a Phase III investigation of the site (13ST323) conducted by archaeologists from the OSA in spring 2016. The skeleton is nearly complete although some of the bones are badly deteriorated. They even recovered a buckle and two metal rings from its collar. The limb bones and teeth indicate that the animal was fully mature but not extremely old. There is no indication of what caused its death. Artifacts found in the same stratigraphic level as this burial date to the 1840s to 1860s. Cherie Haury-Artz analyzed and photographed the dog.